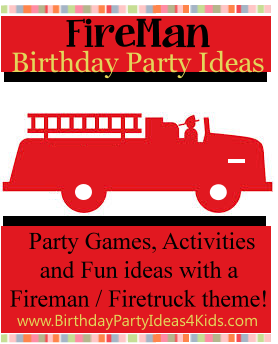 Fun ideas for a Fireman / Firetruck Birthday Party including decorations, invitations, activities, favors and food plus fun Fireman themed games to play. Choose your favorite ideas and then put them together to make a 4 alarm party that everyone will enjoy! Red invitations with fireman / fire truck themed stickers. White cards with black dots for Dalmatians. Go to the local Fire Department and ask if you can take a few pictures of your child on one of the fire trucks. Take the pictures and have them developed and then glue to the front of blank cards to an easy and adorable party invitation. Red and white streamers and red, white, yellow and black balloons. Fire hydrants, ladders, toy fire trucks and Dalmatians. Red or white tablecloth with coordinating plates and cups. If you opt for plain cups set stickers of Dalmatians and fire trucks at each place and let kids decorate the cups with them. Make a helium balloon bouquet for the center of the table and weight it down with a fire truck or fire hydrant. Combine streamers or balloons in red, orange and yellow to look like fire. 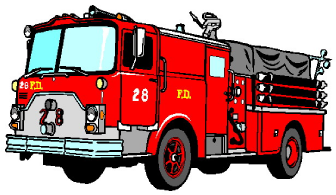 Check with your local fire department and ask if they give tours of the fire station. Let the children explore the fire station and sit in the fire truck. This is a great photo opportunity to get a picture of each child. Take a picture of all the kids in front of the station with the firemen. Many fire stations have free fireman helmets, stickers, coloring pages etc. that they will provide for your party. Don’t forget to bring along some sweet treats for the firemen while you are there! Guests are divided into two teams. 4 buckets are needed - 2 at the start line & two about 25 feet away from the start line. The two farthest buckets are filled with water. Then one at a time players take theri sponge, run to their bucket filled with water, get water on the sponge and then they run to put the water in their container near their team. First team that fills their own bucket wins. Place two sets of almost identical items in two baskets. Find things that firemen would use - rain boots, rain coats, fireman hat, length of garden hose rolled up … etc. Then break the guests into two teams and have them line up behind each other. The first person in line from each team must run to the baskets, put on the clothes and items, run back to the start … then run back to the basket, take the items off and run back to the start to tag the next person in line. The team who finishes first wins a prize. Set up an obstacle course in the back yard with tires, obstacles, tunnels, planks etc. Place a kitten or Dalmatian at the end of the relay race and tell them they must brave the course, rescue the animal and then make it back to the start. Split up into two teams and run the course relay style or let them run through it individually and keep track of their time with a stopwatch. Once they’ve mastered the course make them run through it again holding a length of garden hose or backwards. Fill a fireman theme piñata with red candy - individually wrapped sour balls, red hots, hard candies etc. Before the piñata let the guests decorate red sacks that they can use as a goody bag and also to hold their piñata candy. cut outs or foam stick-ons. Place the picture from the fire station inside. Grill or provide hotdogs, chips, dips, and a fruit tray. Serve Big Red or cherry Kool-Aid. Serve chips and snacks in fireman helmets. Picture frame activity with a picture of them inside from the fire station. Fireman hats - check with your local fire department to see if they have some that are free. Ebay and Oriental trading are also good sources. Hot wheels fire truck and emergency cars. Fireman’s helmet filled with goodies.